Legia Warsaw tweeted this picture after the game with the caption "No comment"
A player was "hit by a stone" leading to a Europa League qualifier between FK Kukesi and Legia Warsaw in Albania being abandoned. 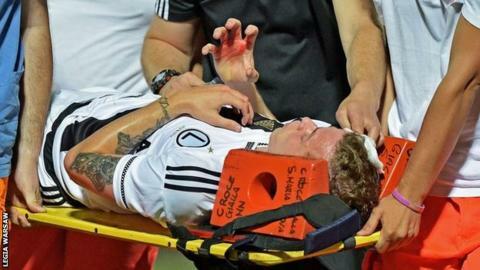 Legia say their defender Ondrej Duda was hit by the object just after they had taken a 2-1 lead in the match. Play was suspended as Duda was taken off on a stretcher and had his head bandaged before changing his bloodied shirt in anticipation of the restart. But the referee then decided to abandon the game on 51 minutes. The second leg of the third round qualifier is due to be played in Warsaw, Poland on 6 August. Legia were thrown out of last season's Champions League qualifying round for fielding an ineligible player during a 6-1 aggregate win over Celtic.